Kahnawake , home to about 8000 Mohawks, is one of the 30 reserves of the Native Canadian in the province of Quebec. It is located approximately 10 kilometers from the city of Montreal just off the Mercier Bridge south of St. Laurent River. I often go to Kahnawake for various shopping needs. The first time I visited their cemetery (as I always do upon discovering a new place), I was absolutely amazed to find construction pieces of metal installed on so many graves. I had some faint idea about the association and found out more about it through Straight Dope. Following is a is part of what Cecil Adams has to say in response to the following question: What’s the deal with the historical hiring of Native American Indians to work on skyscrapers? Have they all truly been blessed with a lack of fear for heights? (I have included pictures that I took in my recent trip to Kahnawake)“…It’s not just any American Indian who goes into ironwork, it’s mostly Iroquois, specifically Mohawks from the Kahnawake reservation near Montreal. The Mohawks got into the business by happenstance. 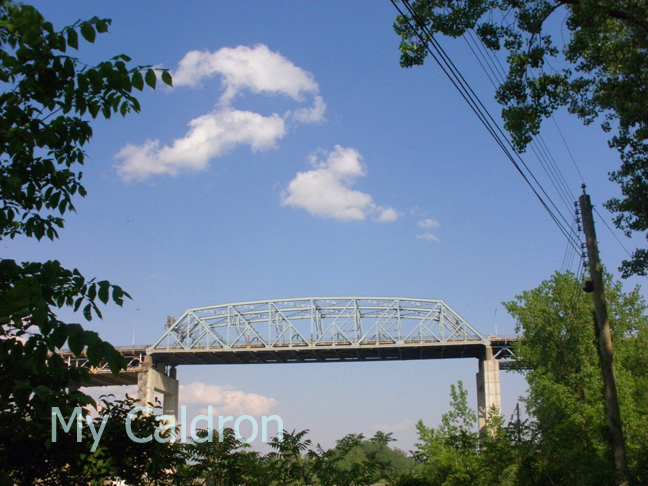 In 1886 a Canadian company was building a railroad bridge over the St. Lawrence river near the Kahnawake reservation. The company hired a number of Mohawks as day laborers, but found they loved to climb around on the ironwork without any apparent fear of heights. Since it was difficult to find men with the moxie for high work, the company decided to try an Indian crew. “We picked out some and gave them a little training, and it turned out that putting riveting tools in their hands was like putting ham with eggs,” a company official later wrote. Mohawks helped build bridges from then on. In 1907 96 men were killed when a span of the Quebec Bridge collapsed during construction; 35 of them were Indians from Kahnawake. The dead were buried in the Kahnawake cemetery under crosses made of steel beams”. Read the rest of the story here, and more pictures below khnawaki reserve and from the Mercier Bridge taken in Kahnawaki and on the bridge looking at the Island of Montreal.